The Catholic-Muslim Forum releases a final statement following its meeting in Rome on 'Working together to serve others'. Young people should be educated to build "respect for others". Inter-religious dialogue is important "to overcome prejudice, distortions, suspicions, and inappropriate generalisations." Pope Francis encouraged participants in their efforts. Vatican City (AsiaNews) - "It is never acceptable to use religion to justify" acts "of terrorism, oppression, violence against innocent persons, persecution, desecration of sacred places, and the destruction of cultural heritage," said the final statement released by the delegates to third seminar organised by Catholic-Muslim Forum. Dedicated to 'Working Together to Serve Others,' the three-day event ended today in Rome. In addition to condemning terrorism and violence, the final statement emphasised the importance for young people to be educated in a way to bolster respect for others. The document also highlighted the importance of dialogue "to overcome prejudice, distortions, suspicions, and inappropriate generalisations" as well as the need "to multiply opportunities for encounter and cooperation on joint projects for the common good." The statement went on to focus the "vital importance of enhanced service and mutual cooperation," underlying in particular, the fact that "The education of young people, be it in the family, school, university, church or mosque, is of the utmost importance for the promotion of a well-rounded identity which builds respect for others. To this end, school curricula and textbooks should portray an objective and respectful image of the other." Pope Francis, who yesterday met with seminar participants, expressed encouragement for the "fruitful" meeting, inviting the latter to pursue the path of dialogue. Card Jean-Louis Tauran, president of the Pontifical Council for Interreligious Dialogue, led the Catholic delegation. Prof Seyyed Hossein Nasr of George Washington University chaired the Muslim delegation in lieu of Prince Ghazi bin Muhammad of Jordan, co-ordinator of the Muslim side, who could not attend for health reasons. 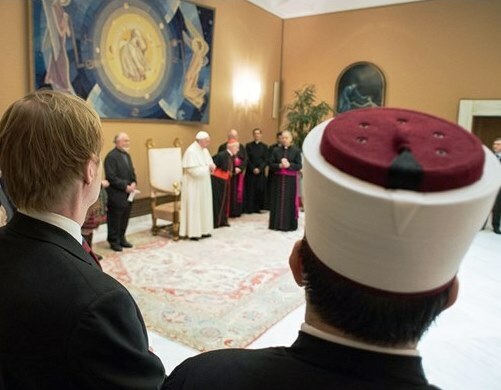 The latter included religious leaders and scholars from Malaysia, Algeria, Bosnia and Herzegovina, Indonesia, United Arab Emirates, Kosovo, Canada, Argentina and Italy.